Hairstyling encompasses many different areas of haircare. 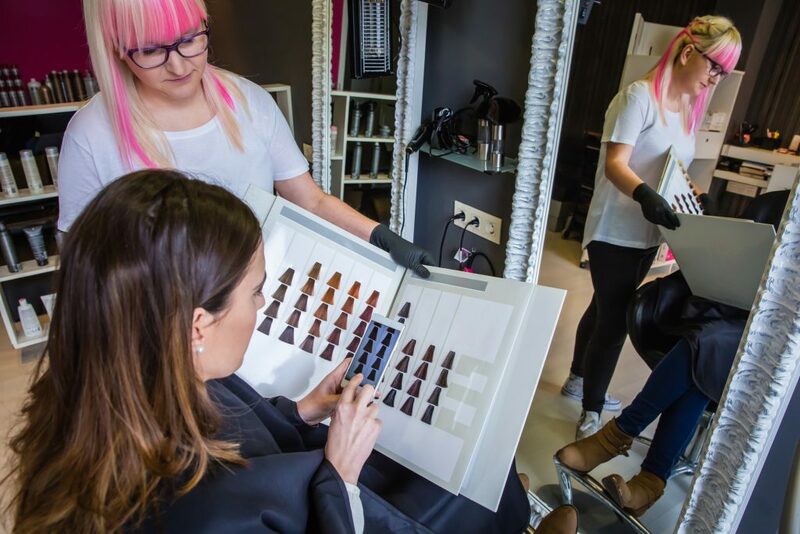 It can include conditioning, repairing, cutting, styling, bleaching, and dying hair, along with services including performing hair treatments and providing hair extensions. These are the skills an entry-level hairstylist will use to help people feel and look like the best, truest versions of themselves. The skills of a qualified hairstylist inspires the imagination, creates a feeling, makes a statement or grabs someone’s attention. Their talents can help people make their look iconic. What is my next move going to be? Where am I going to get the experience I need to achieve those goals? Which jobs will give me what I am looking for as an entry-level hairstylist? You can be the most skilled, innovative hairstylist and still be confused about where to start. Where you begin your career depends on where you are and what you want. However, here are some unique suggestions to kick off your career that will help you head in the right direction. The most common place for entry-level hairstylists to begin their career is in a salon. Cutting, shampooing, coloring, styling and treating hair in an environment gives entry-level hairstylists a high volume of walk-in clients and tons of valuable experience. It allows you to get used to different hair textures and conditions so that you can feel confident in whatever your next step might be. Rushing into a high-pressure performance hairstylist job as soon as you are certified can be difficult. Salon work allows entry-level hairstylists to earn a living and become a seasoned stylist. While any salon job gives you the opportunity to impress clients and succeed, it is also important for the you as a hairstylist to keep your end goals in mind. Entry-level hairstylists should find a salon that has an atmosphere they connect with and that has opportunities for experience in whatever they hope to specialize in. Fashion and film hairstylist jobs are highly coveted and hard to come by, particularly for entry-level hairstylists. It is hard to get noticed or gain experience in such exclusive fields when the hairstylist doesn’t have any connections in the industry. It can feel like it is impossible to find a way in, but don’t give up. Gain experience and build a resume by finding smaller local projects to participate in. Look around any college campuses that have a film program and see if they need a hairstylist. The entry-level hairstylist should get in touch with local and charity fashion show coordinators to let them know that their skills are available for any of their upcoming events. And if the entry-level hairstylist is in an area that has limited opportunities even on the underground level, take matters into your own hands and make your own opportunities. The entry-level hairstylist’s dream may be to create interesting looks for the runway. They may want to work in print fashion as a stylist, so start an underground fashion ‘zine using friends as models. When it comes to getting these high-level jobs, it is important to get a foot in the door and build a portfolio. Color is an ever-expanding facet of hair styling. Coloration blends chemistry with the artistry of visual fashion for the ultimate self-expression. Now more than ever, people are experimenting with extreme and unique hair coloring. A job in coloring, even at an entry-level, can allow you to perfect your technique while creating and developing their own color combinations. This is a sector of styling that is constantly pushing the boundaries of fashion and creativity. Seize every opportunity to help clients realize their personal vision of themselves by practicing different coloring skills. Even small coloring jobs like highlights and lowlights can teach entry-level hairstylists important skills. Small changes can make a big difference if they are made by someone who cares about what they are doing. While this isn’t a job suggestion, hairstyling competitions are a great way to make a name for yourself and gain recognition in the cosmetology industry. They can be difficult to find and get involved in depending on where they are, but participating in a styling competition might be a good idea for an entry-level hairstylist to take advantage of the opportunity. You don’t have to be the “winner” of the show to gain valuable experience from a competition. Adding a competitive element to professional training can help push you to the next level and allow an expanding portfolio. A strong portfolio and a history of competitive styling experience can look good to higher end salons and celebrity clients, who would otherwise be difficult to reach. It is also a great way to perform under pressure if your plan is to break into a competitive field of hairstyling. Social media is a good place to expose a wide range of people to your work. There are a lot of different mediums in social media to show off your skills, so it depends on personal preferences. Create a hairstyling how-to vlog on YouTube, a Instagram account full of your best work or create daily hairstyling tips. However, there are a few things that one should consider and keep in mind before embarking on an online journey to show off your hairstyling . First, it might be a good idea to separate your personal and professional accounts. Having something strictly dedicated to professional work will be less conflicting and more attractive to potential customers or endorsers. Another thing to consider when creating a social media presence is that it is an incredibly open and competitive route. Being authentic will help create and maintain a genuine relationship that will turn into steady revenue. Try to approach the content in a unique, new, or interesting way that will show off your work in a way that will keep your audience and endorsers wanting more. Commercial styling covers a wide range of mediums. Essentially, a stylist works for a brand and is part of a team responsible for the appearance of their models. This includes styling a model’s hair before a photoshoot to styling an executive spokesperson before a promotional speech. The entry-level hairstylist may be called on for video hairstyling for product commercials. It is a career path that can provide an exhilarating array of experiences and can offer travel and event opportunities. Styling for a big name brand might not be possible right off the bat, but there are plenty of new cosmetic and hair product companies. Look for smaller brands that may have the potential for long term success. Stay away from quick fix, highly synthetic products and align with natural products that have a greater chance of success without doing harm to customers. It is important to get experience, even if it is with a new company or product line. Do the best to get to know any of the brands before approaching them. Dedication to the profession and creative problem solving will dictate how far an entry-level hairstylist will go and how high they will soar. It might not always be easy, particularly at first. Find different methods of making things happen. Try things that have never been done before. Come up with ways to make a path if something isn’t panning out. Talent and passion can be more than a paycheck. The entry-level hairstylist should get all the experience they can in all areas of hair and cosmetology, even when what they want long term isn’t available immediately. Then they will use their knowledge and experience to get what they want from their career. Ready to lay a foundation as an entry-level hairstylist that will open unique opportunities in cosmetology and hairstyling? Need to get your undergraduate certificate in cosmetology first? At Minnesota School of Cosmetology, we are dedicated to helping our Cosmetology program students develop a solid foundation and a flair for style through hands-on training in basic and advanced industry techniques. You will learn how to cut, color and style hair, give manicures and pedicures, provide spa treatments and perform various skin care techniques from industry-experienced instructors in a professional salon setting. We keep our class sizes small to make sure you get the individualized instruction you need and attention you deserve. You will graduate with everything you need to be a versatile artist in an exciting industry, including a cosmetology diploma from a respected college. Interested in nail care? Keeping your nails clean and healthy is important to overall appearance and health. When your nails are healthy-looking, you are more apt to use your hands when talking and interacting with people. Whether it comes to your fingernails or toenails, make a routine to care for your nails so that they look their absolute best. The way that your nails look is directly related to their health. For example, if you have an infection of one or more nails, it can create inflammation and health problems throughout the rest of the body. Certain nail conditions can also be embarrassing, like fungus, causing a person to avoid showing off their hands or feet. Keeping your nails clean, trimmed and healthy can also prevent future problems from developing. For example, keeping nails cleaned and well-groomed can prevent fungal infections and bacterial infections that may develop underneath the nail bed. Seek help from a doctor, dermatologist or podiatrist who can help prescribe anti-fungal medication or antibiotics as needed if a problem arises. Taking care of your nails is important, and there are certain things that you should do and shouldn’t do to keep up with the health and appearance of the nails. In many cases, bad nail habits can be reversed. You should devote some time each week to clipping, trimming, filing and polishing your nails and checking out each nail for signs of infection, inflammation or fungal infections. Glass files are incredibly gentle on the nails and meant to prevent breaking and cracking. When using a glass file, file in one specific direction to prevent further damage to the nail bed. This may take some getting used to, but the nails break far less often because of this habit. Keeping your nails trimmed and polished is vital to how they look, feel and overall health. Many nail polishes aren’t just pretty, but they are good for your nails. Some polishes even contain strengthening ingredients that prevent cracking and breakage. Other types of nail polish are even ideal for maximizing growth. Remember to treat the fungus rather than just covering it up with nail polish. Nail care tools should be replaced every few months. Not only does this prevent the use of tools that have signs of wear, tear and rust, but will also help hygiene. They are less likely to contaminate client’s nails with fungus and bacteria. Sterilizing nail care tools is crucial for preventing contamination. Sterilize nail care tools by soaking them in alcohol for several hours or use an alcohol-soaked cotton ball to carefully wipe down tools. Remember to not allow the tools to sit in any disinfecting solution for longer than a few hours, as this can cause rusting. Also, be sure to thoroughly dry the tools after they have been cleaned. Cuticle oil can help to dissolve the cuticles as well as moisturize the area. This makes it easier to push the cuticles back to create a uniform nail bed for polishes and treatments. Cuticle oil should be used before pushing back the cuticles unless otherwise specified. Cuticle oil keeps your nails looking clean, healthy and moisturized. Whether washing dishes regularly or gardening, wearing gloves will protect your nails and keep them from breaking and cracking. Gloves will also prevent nail polish from wearing away. It is also important to wear gloves when working with corrosive products such as furniture polish, bathroom cleaner and bleach. Keep gloves where they’re easy to find and grab when they need to be worn. Filing nails in a back and forth motion causes nails to split, crack, and break. The delicate nail bed is being ripped every single time it gets filed back and forth. Traditional emery boards can cause ripping and tearing of the nail bed, especially if the file is older and hasn’t been replaced in a while. While the look of cuticles can be unsightly, it is not healthy to push them back too far. Avoid using electric nail trimmers to push back and remove cuticles, as they can compromise the nail bed and create cross-contamination of bacteria and fungus. Sharing nail care tools can cause cross-contamination. For example, sharing nail clippers with a person who has toenail fungus can transfer nail fungus to everyone’s nails that uses the contaminated nail clippers. One of the most common skin-related conditions to catch from sharing nail care tools are warts. Signs of fungus and infection often start out minimally and continue to get worse. Nail fungus often looks like white, milky spots on the surface of the nail. These are often mistaken for signs of excess calcium and keratin. White spots eventually begin to create a thickened nail that splits and bends. Infections can cause inflammation around the nail bed, causing pain, swelling and blood blisters. If your nail looks different than normal, seek the help of a nail technician or doctor. In a bind, you may be tempted to use their nails as tools. People use their nails regularly to open cans, rip paper or scrape food off a pan or pot. Using your nails as tools can cause breakage and cracking, not to mention the bacteria that is introduced underneath the nails and into the nail bed. Biting your nails not only prevents them from growing out, but it can also cause inflammation and infection. The mouth is the dirtiest part of the human body, and there are millions of bacteria that thrive on the teeth, gums and tongue. Unfortunately, every time someone bites their nails, the bacteria from the mouth gets on and underneath the nail, which can be a catalyst for a nail infection. It can often be difficult to get into a solid nail care routine if you are used to caring for their nails a certain way. A certified and trained nail technician helps to care for the nails and nail-related problems. Nail technicians go through training to handle all types of nail care and polishing techniques. They work with clients of varying needs and can recognize common nail-related conditions that might go unnoticed. The nail technician can also help advise clients on how to properly care for their nails and keep them looking their best. The nail technician also recommends variety of different products if a client is confused as to which product will work best for them. A nail technician should inquire about a client’s nail condition and infections of any kind before they begin working on the client’s nails. This helps the nail technician to use specialized tools specific to the condition. Did this discussion interest you in becoming a nail technician? Your search for a nail technician program ends at Minnesota School of Cosmetology, where you learn all the tricks of the trade to provide the look and TLC clients are looking for. Our campus locations are convenient, if you are looking for beauty schools that can train you to become a licensed nail technician. You will graduate with a firm understanding of the anatomy of the nails and the skills to perform a variety of nail services, including manicures, pedicures, gel polish applications and nail art. Contact us today to learn more about starting a rewarding career in the beauty industry. Makeup means something different for everyone. Some people like to keep it natural with just a little gloss and some mascara. Others might like taking it a little bit further with some eyeliner and some brow filler. You might even be so bold as to make your lips glitter and wing out your liner like Amy Winehouse. The point is that makeup is a way to express yourself, no matter how much or how little you use. A variety of products exist, and brands are always coming up with new and innovative things in the way of makeup. Bold lips and dramatic eyes are not just for the runway now. You can delve into the world of drugstore cosmetics, natural cosmetics and luxury cosmetics. 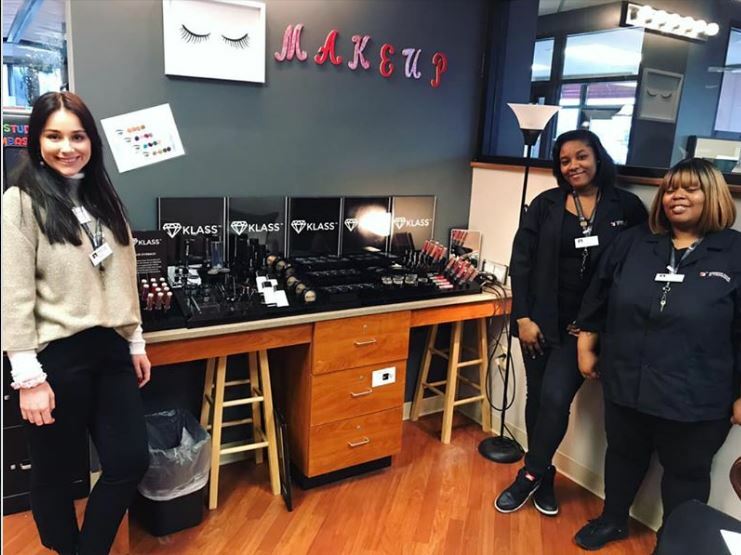 Earlier this year Minnesota School of Cosmetology started a partnership with KLASS Cosmetics as a way to find a good quality makeup line for the Esthiology and Cosmetology programs. KLASS Cosmetics is a local company headquartered in Hudson, Wisconsin. Both Minnesota School of Cosmetology campuses in Woodbury and Plymouth, Minnesota have KLASS Cosmetics showroom displays. Students pursuing Esthiology or Cosmetology receive a full airbrush kit and access to the KLASS display. By using these displays, students work towards meeting their salon board quotas for the state. The cool thing about KLASS Cosmetics is that all of their makeup and skincare products are created with natural ingredients and contain no parabens. The liquid makeup products are all moderate coverage and easily blendable as they glide right onto the skin. The powder varieties are all incredibly silky and melt into your skin for a flawless complexion. The cream and powder shadows give a great color payoff with very little fallout making it easy for application to achieve any eye look you desire. With a variety of different eyeliners your options are endless whether you choose a sharp winged look or just a fine line to accent your lashline. To finish off your look you can choose from 4 different lip products to fit your desired look: gloss, plumping gloss, liquid matte lipstick or shine lipstick. They are all velvety and hydrating on the lips. KLASS Cosmetics stands out for a couple different reasons. In addition to being completely paraben free this cosmetics company has a partnership with PETA and their “Beauty without Bunnies” program. This means the products are made in cruelty-free labs in the United States. All the manufacturer’s standards are PETA approved. With a current trend of vegan and cruelty-free items becoming more popular, especially in the beauty industry, clients are looking for more ethical products in their cosmetics and skincare routines. KLASS also stands out for their KLASS ACT program. This program founded by KLASS Cosmetics COO and President Nick Raehsler gives back to women of domestic violence and sexual abuse. For every purchase made the KLASS ACT foundation will donate an additional item to organizations to help women in need. Their website commitment mentions, “We believe, at the heart of our business, that charitable giving extends beyond monetary donations. We have chosen to spread love through KLASS ACT by gifting products to charities that empower women who are victims of domestic or sexual abuse, serious illness, and poverty. “Buy One, Give One …and share the gifts of joy and beauty.” KLASS is a pioneer in a cosmetics company “giving back.” They are truly paving the way for great things. Swedish massage is the most popular type of massage found in spas, health clinics and resorts. It is also a popular choice for massage therapists practicing their skills to serve many different clients. Because of its relaxing and therapeutic nature, many people prefer Swedish massage. Not only is it beneficial to the overall wellness of the massage client, but it can help them to relax and feel rejuvenated in a way that they never thought possible. When most people think about a whole-body massage, they are picturing a Swedish massage. Swedish massage is the foundation for many types of massage therapy. Swedish massage movements help warm up the muscle tissue, release tension and break up muscle knots. Swedish massage combines these movements with joint movement to relax and energize the body. What Makes Swedish Massage Different? During a Swedish massage, the massage therapist will lubricate the skin with massage oil and perform various massage strokes. The specific massage strokes include effleurage (gliding) strokes, petrissage (kneading) strokes, friction, tapotement (percussive) strokes, and vibration. Swedish massages should always be done in a calm and relaxing environment so that the client is able to relax. Because long, gliding strokes are often required to perform the massage properly, oil is often used in conjunction with the hand movements. Essential oils have many different beneficial properties on their own and becoming familiar with each is important when becoming a massage therapist. Some of the most common essential oils used in the practice include lavender, geranium, coriander, patchouli, sweet orange and cedarwood. Each oil has special properties and it is important to listen to your client. It is important to avoid using oils on clients who are sensitive to the fragrance. Always discuss oils with clients and give them the option to choose which one they would like to utilize. Likewise, all essential oils need to be mixed thoroughly with a carrier oil. Most essential oils are too potent to put directly onto the skin and can cause irritation and chemical burns. Some of the most common carrier oils include almond oil, jojoba oil, hemp seed, emu oil, grapeseed oil and olive oil. Carrier oils not only help to dilute the essential oil, but they often contain a myriad of health and skin benefits themselves. You will be working with a variety of clients with varying needs. One client may come to you because they want relaxing couple’s massages, while another person might come to you because they are experiencing muscle strain and pain. It is up to you to work with clients on an individual basis and to give them what they need. One client may want essential oils, while another wants just a carrier oil. Some clients will be specific in where they need tension relief, while others will give you freedom to use your own technique. By treating each person as an individual, you will find that this improves your ability to work as a massage therapist performing Swedish massages. There are five primary strokes involved in Swedish massage and used on clients depending on their needs and what they want to have done. 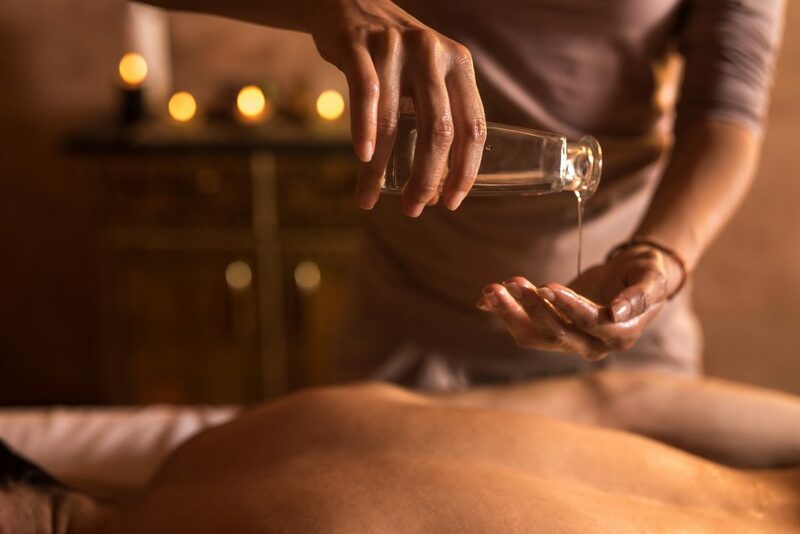 These long, flowing strokes are part of distributing the oils onto the skin as well as allowing the massage therapist to feel the muscle tone for better precision of the massage. This stroke involves kneading the muscle and tissue to help flush out any metabolic waste and toxins found in the area. It’s crucial for eliminating built-up lymphatic fluid. These fast, short movements are specifically done to produce heat on the skin and are crucial for bringing vital blood flow to the area. Friction strokes are also great for loosening sore and strained ligaments. This is the quintessential “karate chop” type stroke that most people are familiar with when it comes to receiving a Swedish massage. These strokes, or chops, are most often used to relax tense and sore muscles. Vibration strokes create movement in the entire body and when done correctly by the massage therapist, they can be incredibly relaxing and rejuvenating while improving circulation. The Swedish massage was designed and developed by a man named Per Henrik Ling, who hailed from Sweden. He brought the technique into the United States in 1858 and named it the Swedish Movement Cure. By combining techniques from the Chinese, Roman and Greek massage therapies, he developed this unique massage specifically to relax and rejuvenate those who received it. Not only does the massage helps to ease tension and muscle strain, but it also helps to improve circulation as well as help with draining lymphatic fluid. Because of the large number of benefits that come from having this technique performed, it is no wonder that going for a Swedish massage is a common and a wonderful way to both benefit from the physical and mental aspects of each session. For this reason, massage therapists need to be well-versed in this technique so that they can provide their clients with a wonderfully unique experience. The great thing about most massage therapy programs is they are relatively quick and teach students all the techniques necessary to begin working in the field of massage therapy. Massage therapy training is crucial for learning how to perform a proper Swedish massage. Because many clients turn to massage therapists when they are dealing with stress, muscle tension, aches and pains, being able to perform the technique properly is important to help these individuals. Becoming a therapist who specializes in performing massages is critical in developing a career that you can feel proud of. Not only will you be helping a wide range of clients of varying needs, but you are doing something that is highly rewarding and is a skill that you can use for the rest of your life. Massage therapists who perform massages often work with clients, but they can also help family members and friends who need muscle relaxation and the relief of tension and stress. Skincare encompasses a range of services, products and procedures. While some can maintain healthy skin with their skincare routine, there are many people who prefer professionals. Skincare professionals help others in their pursuit of vibrant, youthful, healthy skin. However, knowing what kind of skin care professional you need can be tricky. Dermatology and esthiology are both professional studies of skincare. While there is similarity, there are also significant differences between the areas of expertise. Let’s look at some of the differences and similarities in the dermatology and esthiology fields. Both Dermatology and Esthiology care for your skin. They both can also include services that care for your nails, hair, and scalp. There are, however, some major differences in the scope of services each profession provides. Many esthiology programs will have a class on dermatology. Dermatology is a medical field that diagnoses skincare conditions and treatments. This includes identifying rashes to diagnosing and treating skin cancers/disease. Whether acne conditions or a treatment as complex as a skin graft, dermatology deals with the medical and surgical sides of skin health. A dermatologist prescribes medications, treatments, therapies and recommends and performs surgical procedures. Dermatology encompasses life-saving and cosmetic medicine for various conditions. Esthiology is not a licensed healthcare profession, but it does focus on health and wellness. While dermatology deals with skin health in a medical sense, esthiology focuses on maintaining the health and appearance of your skin. Cosmetics is the main intention of esthiology, and estheticians can offer different services. An Esthetician performs peels, waxing, massage and cosmetic therapies. Treatment depends on your skin goals, preferences, and skin condition. The wellness aspects of esthiology focuses on skincare routines that help to maintain the integrity and glow of your skin. Due to the differences in their expertise, there are different education requirements for esthiology and dermatology. Not only do these studies differ in focus, but the length of time to complete the training for each field varies. Dermatology focuses on a range of anatomy, diagnostic training and treatment. There are specialties within the field that varies the education requirements. For example, a dermatologist that focuses on surgical treatment will have different areas of study than someone studying dermatology research. Both will need to know how skin functions and reacts. So regardless of the end goals of a dermatologist, medical school is a standard requirement for all physicians. Esthiology is an area of skincare study that focuses its training in areas of aesthetics. Estheticians focus mainly on techniques, methods and execution of the various services they will be offering. While there is basic skin health and anatomy covered in esthiology, it is geared heavily toward these services. This training also covers products, recommendations and explanations of new methods and tools. Becoming a dermatologist requires more training than esthiology. It can take 12 years to become a dermatologist. Esthiology programs can be completed in 12 months or less. The difference in these program lengths can be a deciding factor for those who debating between dermatology and esthiology. Along with being the more time-consuming option, the increased level of education required for a medical degree in dermatology also leads to it being the more expensive option. Whether the focus is a patient’s health or a client’s happiness, estheticians and dermatologists are client facing professions. Even if it is in different ways, the purpose of both professions is to make people’s lives better. People skills are a must in a majority of professions, but are especially necessary when dealing with personal issues. Sensitivity and compassion helps when you try to understand a person’s problems and concerns. People should be comfortable to open up about skin issues to professionals without fear of judgement. A rapport built on trust can result in the comfort of the patient or client, but it also increases their likelihood of returning. Likewise, interpersonal skills are vital when trying to understand your client or patient’s results. If you misunderstand your client, it is almost impossible to avoid discouragement and frustration. Clients and patients want to feel hopeful, safe, and empowered. There are differences in the training requirements for both professions. Neither dermatology nor esthiology are safe to practice without being properly educated and certified. It is dangerous for clients to receive therapies and treatments for their skin from anyone who is not trained. While this is more obvious in the case of dermatology, there can also be serious consequences if someone practices esthiology without an education. Even services such as facial and body hair waxing require proper storage and temperature control to avoid burns. A fundamental understanding of the waxing areas and skin issues that may be affected by hair removal is also important. Training for dermatology and esthiology also gives skin care professionals an extensive knowledge about products. Dermatologists may recommend prescription or surgical solutions. They, along with certified estheticians, can also provide recommendations for more basic skincare products and remedies. Sometimes easy changes in skincare routines can fix a problem. Other times it can be as simple as switching to a gentler product formulated for their skin type. But regardless of the issue, the information and recommendations need to come from professionals to avoid using toxic or harmful products. If you have a passion for skincare, you could begin your career as an esthetician at the Minnesota School of Cosmetology (MSC). Our Esthiology Diploma Program is designed to be completed in under 5 months (600 clock hours) with full-time enrollment. Our esthiology diploma program has been developed by talented, caring, real-world professionals, many of whom still work in the field. We give our esthiology students experience in skincare, waxing, make-up, application of facials, and more. Contact us today to learn more about becoming an esthetician and starting a rewarding career in the beauty industry. Coloring your hair is one of the biggest changes you can make to rejuvenate your appearance. You may be nervous about making such a serious decision about your look, and rightfully so. There is a lot to consider, but also a lot to be excited about. Preparation, the hair coloring itself and aftercare are all important to the success of your hair color changes, and it is important to consider each area very carefully before going all in on a brand-new look. Before your hair undergoes whatever color transformation you have planned for it there are things that you need to do to prepare. Hair dyes and bleaches have harsh chemicals that can be extremely hard on your hair, particularly if you aren’t careful beforehand. Starting with healthy hair may not be the most glamorous or fun part of the coloring process, but it is essential to successfully achieving the look that you are going for. The amount of damage done when coloring can be minimized by making good choices about the hair dyes you use, but at the end of the day hair coloring requires the use of chemicals. The harsh effect of these chemicals can be amplified if you’re starting with hair follicles that are already damaged. Achieving a proper moisture balance can help strengthen and revitalize any damage you may have already done before stressing your hair out with bleaches and colors. Try your best to be patient with your hair. I know you can hardly stand to wait for your exciting new color transformation to happen but rushing things can lead to disappointing results. Being in a hurry could cause you to damage your hair to the point that it takes months or even years to come back properly. It can be difficult not to shortcut to the “fun” part, but it will be worth it when the final result looks every bit as good as you want it to. Curling irons, flat irons and hair dryers are some of the most commonly used heated styling tools, but can cause damage if not used carefully. Even using them too frequently can cause hair to be dry and brittle. Before embarking on your exciting color adventure, it might be wise to minimize the use of hot tools and give your hair a break. This could be a good time to explore heat-free styling techniques and think outside the box a little bit. Leaving split and fried ends is never a good idea, but especially when it comes to coloring. Getting rid of dead, dry ends will help your hair repair itself and can assist with the overall health and growth of your hair. Even if you are only getting highlights or touching up some gray, cleaning up damaged ends is a helpful step in preparing for whatever colors you have in mind for the beautiful new you. Whether you want a vibrant, multi-colored rainbow look with color transitions and fading or you are looking for some hi-lights or lo-lights, coloring is an incredible way to breathe new life into your hairstyle. Here are some tips to make sure that all of that change to your look ends up being for the better. This might seem difficult if you don’t already have a reliable hair colorist you go to already. It can be challenging to feel like you can trust someone you’ve never met with such a dramatic and immediately visible change to your look. You can ask other professionals in the cosmetology field for their recommendations, ask friends for advice, and look at online reviews to help you feel more at ease with the idea. Make sure that the hair colorist you choose is certified in their field and operating from a licensed salon. Having a basic concept of what you want can work in some areas of cosmetology and beauty, but hair color is specific. Mere shades can make a significant difference in the way a look comes together. having a vague idea or acting spontaneously can lead to fantastic looks, but often they lead to disappointment, regret, and some serious revitalization treatments. Being sure about your decision is the best way to know you’ll be happy with it long term, so don’t be afraid to take your time and think on it if you need to. Sometimes, words fail us. You try to explain the specific look you are going for, but it can be hard to know if you got your message across. Therefore, it is always wise to have multiple visual references of the colors and affects you are looking for to show to your hair colorist. This will allow them to ask you questions and voice any concerns they may have with your hair color goals. It will also allow you to discuss alternatives and solutions to any issues there may be. A clear understanding between you and your hair colorist about what you are hoping for will help you get an end result you are thrilled with and help your hair colorist give that to you. Sometimes, a picture really is worth a thousand words. It can be tempting to impulsively run to your nearest beauty supply store and grab boxes of hair dye the second the idea comes to mind. For extremely simple color projects a DIY dye kit might do the trick. However, even those can be messy, uneven and can end up fading quickly. Utilizing professional skills allows the benefit of professional products and equipment, keeps you from damaging your belongings with chemicals and colors, and keeps you from accidentally damaging your hair. All coloring is a process. Some styles take longer than others and a lot depends on the hair you are starting with. Your natural color, texture, cut, and previous coloring history all play a factor in how long the process takes. Prepare for a few hours of time in most cases and don’t schedule your appointment on an already busy day if you can possibly help it. There is a definite difference between taking advice or suggestions and being bullied by a hair stylist into a look you didn’t really want. If your hair colorist suggests something you like, go for it! If they have a concern, discuss it and allow them to provide you with an alternative. But there is also no shame in going home and thinking about it before you say yes to any changes to the original plan. After the hair coloring is done, the best part begins! You are all ready for the world to get a good look at the striking new you. There are some things you are going to want to keep in mind so that you can keep the look you want for as long you want it. Of you course you are going to want to immediately show off your new look, but make sure you protect it. A conditioning treatment that doesn’t need to wash out will help maintain a protective barrier against the impact of things like brushing, twisting and tying. Also, it will maintain moisture for those times you want to curl or straighten it. The more you wash, the more your hair color fades. However, no one should sacrifice hygiene for color, no matter how truly epic it is. Dry shampoo will help you keep your hair clean without compromising the color with the scrub and rinse of a traditional shampoo. Lather shampooing will still be necessary, but dry shampoo will help you keep you color for as long as possible. Touching up your exciting new look after hair growth or fading will help you keep it as vibrant as it was on day one. The more dramatic your look, the more frequent your touch-ups will need to be. Keep up that gorgeous new look and keep turning heads! Not only can hot water damage follicles, but it also is more effective at fading and washing out dyes. Washing with warm water instead of hot will help you cleanse without damaging. Rinsing with cold water after conditioning can help seal in the moisture. Sulfates are a harsh detergent ingredient found in many common shampoos. It acts as an astringent to clean dirt and excess oils, but it can also be harsh and damaging to your beautiful new look. If you are having trouble finding a shampoo that isn’t harmful to the style you love, ask your hair colorist or hairstylist for some product recommendations. The color changes you make to your look can be as shocking or as subtle as you want them to be. Following these tips will help you both achieve and maintain your hair color. Ready to lay a foundation as a salon hair colorist that will open up unique opportunities in cosmetology and hairstyling? Need to get your undergraduate certificate in cosmetology first? At Minnesota School of Cosmetology, we are dedicated to helping our Cosmetology program students develop a solid foundation and a flair for style through hands-on training in basic and advanced industry techniques. You will learn how to cut, color and style hair, give manicures and pedicures, provide spa treatments and perform various skin care techniques from industry-experienced instructors in a professional salon setting. We keep our class sizes small to make sure you get the individualized instruction you need and attention you deserve. You will graduate with everything you need to be a versatile artist in an exciting industry, including a cosmetology diploma from a respected college.